Promaco Conventions has an exceptional reputation as one of the leading event organisers in Australia. We can provide your conference with the most comprehensive and professional organisation and management in Perth. Our policy is to ensure that each event receives our full personal service at all times and we are always prepared to go that ‘extra mile’. We manage each event as if it were our own and maintain the highest in professional standards. 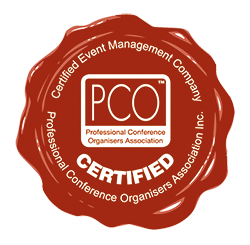 Promaco Conventions was established in 1987 by Don Pearce, former chairman of the Perth Convention Bureau and co-founder of the Meetings Industry Association of Australia. 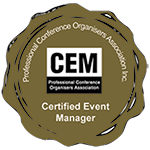 24 years and 400 conferences later Promaco Conventions has been taken over by Success Events Management Pty Lty with new Managing Director Livia Russell and Don Pearce staying on the team as a consultant to the owners. Livia has over 10 years’ experience in events management and has worked in the hospitality industry for over 15 years across Europe and Australia. She has studied hotel management in Switzerland and graduated from her Master in Business Administration at UWA in 2011. Livia has successfully organised numerous major national and international conferences for up to 800 delegates. Livia’s very efficient and practical approach in making the event happen has been very much appreciated by the clients and ensures a very smooth running of the event. Livia’s immaculate organisation skills and trying to make it easy for the client is one of Livia’s major strengths and will make every conference a fantastic success. Contact Livia directly via Emai. After completing her bachelor degree of Public Relations & Tourism and Events Management at Curtin University, Grace joined Promaco Conventions in the position of Conference Coordinator mainly dealing with promotion, media and sponsorship management. And after 5 years with Promaco, Grace is now the conference manager, bringing a wide range of skills and industry experience to the team. Grace’s new role involves managing and supporting the team on each event, liaising with and assisting clients and is the point of contact for those needing assistance in organising an event. Contact Grace directly via Email. Suzanne has nearly 10 years’ experience in the events industry. Since acquiring her first-class honours BA degree in business and event management, Suzanne has organised and executed many types of events for a variety of markets in three different countries. With a diverse range of experience to draw on Suzanne prides herself on excellent communication and delivering events that exceed client expectations. Suzanne will work closely with the event manager managing all logistical and operational aspects of the conference, from conception to delivery. Contact Suzanne directly via Email. Sharen has been with Promaco since its commencement in 1987 and has gained vast experience in all areas of conference management. Sharen currently takes care of the delegate registration process and speaker arrangements and is always happy to provide some extra information for the attendees who wish to extend their stay. Sharen makes sure that the attendees’ event experience is above expectations. Contact Sharen directly via Email.